It contains all the latest happenings in the world of sports especially with cricket and motorsport. Catch live cricket scores here. Is Vettel losing the 2017 Formula 1 Championship plot? Sebastian Vettel starting on pole and finishing as race winner would have been an ideal situation for the millions of Ferrari fans watching the 2017 Singapore Grand Prix. However the script turned out to be different. Weather played a role in changing this script but it was more of Vettel doing the damage to himself. The qualifying sessions were held in dry condition whereas on race day we had rains, making the circuit a bit tricky. Hamilton the championship leader was starting on the third row and the Ferrari's could have been easily ahead of him if the accident did not occur. 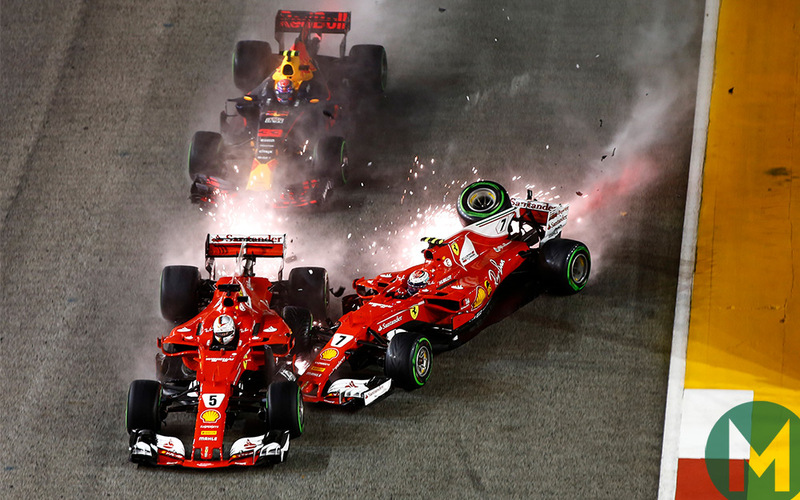 Vettel dived ahead of Max Verstappen and stated a chain reaction which engulfed him. Why did Vettel do that? Was it to prevent Raikkonen from taking the lead? The result - Verstappen hits Raikkonen who hits Vettel and its game over for all three cars. Vettel not only had to retire but also had to see Hamilton winning the race and stretching his championship lead to 28 points. What difference did Hamilton find in those intermediate tyres on race day which he did not find during his qualifying stint in dry conditions we will never know. With the tables now reversed in the second half Vettel would do well to avoid such disasters in the future races. With the form Hamilton has shown in the second half any DNF from Vettel would only widen the gap and dash his hope of becoming the 2017 Formula 1 champion. Get ready to stay awake till late in the night. Beginning from 10th June we will be treated to a month long football extravaganza. Spain are the current reigning Euro Champions but they have to defend their title against 23 other contenders. UEFA Euro 2016 will conclude on 11th July. The draw for UEFA Champions League 2013 Semi Final Schedule was held last night. We now have the two German teams taking on the two Spanish teams. The 2013 F1 racing calender has been out. Formula 1 racing starts on 17th March with the Australian Grand Prix. The Formula 1 2013 schedule consist of 20 races. In a tense penalty shootout situation during the Italy - England Quarter final match, when Italy were down 1-2, Andrea Pirlo kept his cool and took the penalty kick which turned the match in favor of the Italians. Soccer freekicks are always interesting. One look at the Andrea Pirlo free kick in the euro 2012 match against Croatia. will take your breath away.